Why Advertising People Are Annoying | brainsnorts inc.
Not only do I love sports, but I’m one of those people who take sports too seriously. For example, it’s not a secret that my favorite sports team of all sports teams is the New York Yankees. Their uniforms do NOT have names on the back, but sporting goods stores regularly sell Yankees jerseys WITH names on the back, and that pisses me off greatly. Of course I shouldn’t care, but I do. I’ve written previous posts about things involving sports that were wrong, such as mistakes in films that involved sports, but this one – for me – is way worse. And although most of the rest of the world would say, “Really? You really care about that? You have too much free time.” And that’s not wrong, but if you’re going to spend millions of dollars to produce a commercial, you’re going to look like an idiot if you can’t get it right. Yokohama did not get it right. 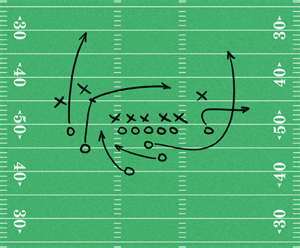 Now, to compare, here’s an example of a typical football play as they are drawn up by coaches. Notice the little X’s and O’s on the diagram? They represent football players. The O’s are for the offense and the X’s are for the defense. But did you notice something in the commercial? No, you probably didn’t because you’re normal and I obsess over sports. In the commercial, there were X’s used to represent the offense and O’s for the defense, which is exactly the opposite of what it should be. First, someone get me a secretary. Then, have my secretary get Yokohama the phone so I can tell them to fire someone. Thanks. You can go back to the things in your life that are way more important than this brief rant. I can understand your love for sports… even though I don’t share it… and your watching every move, and knowing how the teams prepare the plays… all of that. What I can’t understand, is why you’d bother to watch commercials… and then get upset over them. Thanks, sir. We all have to let off steam once in a while. The commercial was obviously written by someone who never set foot on a football field. Man! You must really get pissed off at the majority of books on the market that don’t research any details. What gets me is when a movie is made from a set era and the clothes or expressions are mixed up with another decade.. I have Yokohama on line two. Thanks. You have just earned your first bonus and raise. I can get you a secretary, but it certainly wont be me. No offense to receptionists.